The Ngorongoro Crater is often called ‘Africa’s Eden’ and the ‘8th Natural Wonder of the World,’ a visit to the crater is a main draw card for tourists coming to Tanzania and a definite world-class attraction. Within the crater rim, large herds of zebra and wildebeest graze nearby while sleeping lions laze in the sun. At dawn, the endangered black rhino returns to the thick cover of the crater forests after grazing on dew-laden grass in the morning mist. Just outside the crater’s ridge, tall Masaai herd their cattle and goats over green pastures through the highland slopes, living alongside the wildlife as they have for centuries. 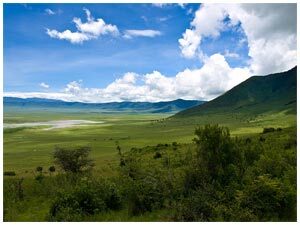 Ngorongoro Conservation Area includes its eponymous famous crater, Olduvai Gorge, and huge expanses of highland plains, scrub bush, and forests that cover approximately 8300 square kilometres. A protected area, only indigenous tribes such as the Masaai are allowed to live within its borders. Lake Ndutu and Masek, both alkaline soda lakes are home to rich game populations, as well as a series of peaks and volcanoes and make the Conservation Area a unique and beautiful landscape. Of course, the crater itself, actually a type of collapsed volcano called a caldera, is the main attraction. Accommodation is located on its ridges and after a beautiful descent down the crater rim, passing lush rain forest and thick vegetation, the flora opens to grassy plains throughout the crater floor. The game viewing is truly incredible, and the topography and views of the surrounding Crater Highlands out of this world. This truly magical place is home to Olduvai Gorge, where the Leakeys discovered the hominoid remains of a 1.8 million year old skeleton of Australopithecus boisei, one of the distinct links of the human evolutionary chain. In a small canyon just north of the crater, the Leakey's and their team of international archaeologists unearthed the ruins of at least three distinct hominoid species, and also came upon a complete series of hominoid footprints estimated to be over 3.7 million years old. Evacuated fossils show that the area is one of the oldest sites of hominoid habitation in the world. 4 Days Ngorongoro Lodge safaris, Lake Manyara Lodge Safari, Ngorongoro Serena Lodge, Lake Manyara Serena Lodge, Ngorongoro Sopa Lodge, Lake Manyara Hotel, Tanzania Safaris, luxury lodge safaris, Tanzania luxury lodge tours. Distance: 190 km (4 hrs.). Pick up from your hotel in Arusha Town. Drive to the crater with unique views of the high altitude rain forest surrounding the ring. Lunch at your lodge. Afternoon descend to the crater for game viewing. Ngorongoro Serena Lodge built into the rim of a dormant volcano. The plant and ivy-covered native stone blends perfectly with the surroundings. Guest rooms have private terraces with views of the crater floor where countless animals make their home. Lunch at the lodge and afternoon you will have crater tour. This collapsed caldera is 610 meters deep and has a floor 18 km wide. Views from the rim of the crater are spectacular. The crater has become a unique conservation area where Lion, Elephant, Rhino and Buffalo roam in perfect safety. Dinner and overnight at Ngorongoro Serena Lodge or Ngorongoro Sopa Lodge, L,D. Full day spent in Ngorongoro Crater with a crater tour session for game viewing on the crater floor of one of Africa s true wonders of nature, home of rhino. Dinner and overnight at Ngorongoro Serena Lodge or Ngorongoro Sopa Lodge, B,L,D. Distance: 60 km (1 hr. 30 min.). After breakfast depart to Manyara. Lunch and afternoon game drive in this superb scenic park set around Lake Manyara, most famous for the tree climbing lions. Lake Manyara is a birdwatcher's paradise. Marvel at the variety of species, spoonbill, teal, pelican, kingfisher, hornbill and cormorant. In the tall trees, forest monkeys leap from branch to branch on the slope of the Great Rift escarpment, elephants stand in the shade of the baobab; and in the acacia woodland, lions lie draped along the branches of the umbrella trees. Dinner & overnight at Lake Manyara Serena Lodge, B, L,D. Distance: 130 km (2 hrs. 30 min.). After breakfast drive back to Arusha for drop off at your hotel.